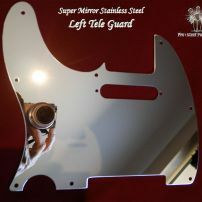 commented on "Gibson SG Extended Pickguard Set Super Mirror Stainless Steel Tenon Cover Truss Cover Chrome Guards"
It's show time for your legendary Gibson SG, an extended guard to match the width of Humbucker surrounds. 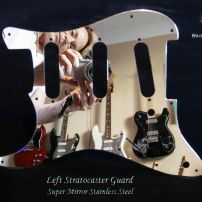 A perfect fit for plastic or metal Humbucker rings, a 3 Piece Set made of Super Polished Mirror Stainless Steel. Worldwide Airmail. 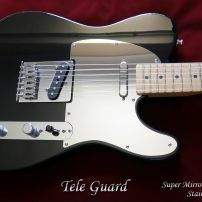 commented on "Super Mirror Pickguard for Two Humbucker Fender HH Telecaster or Blacktop Tele Chrome Steel Guard"
commented on "Super Mirror Tele Guard Polar White Fender Player 2018 Telecaster Stainless Steel Pickguard"
Graham from UK, matching the original chrome bridge and control plate with the stainless Super Mirror Tele guard, a Player with harmony. 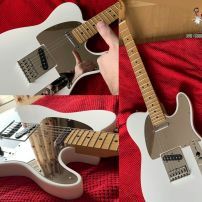 commented on "Fender Telecaster Mirror Guard Chrome Polished Stainless Steel Metal Tele Pickguard"
commented on "Fender Elite Aged Cherry Burst Strat from Rickey with the Stacco polished stainless steel guard"
Not a common fondle the Elite, and in an ideal world we all should have one. 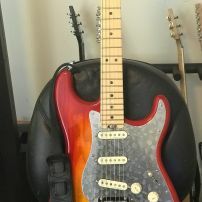 But Rickey has doubled up with this fab Aged Cherry Burst, fitted with a Stacco etched guard. 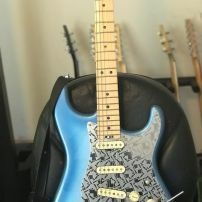 commented on "Rickey's Sky Burst Metallic Elite Stratocaster with a Kaleido stainless steel etched guard"
From Georgia USA, Rickey's Elite Strat drops in for a view before it hit's the road for another tour, with a new Kaleido guard. 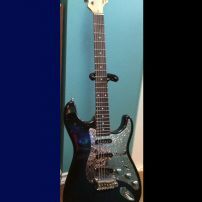 commented on "Blueburst G&L Legacy Tribute and Silver Nova stainless steel pickguard chrome knobs"
The Blueburst G&L Tribute and Silver Nova guard from Joseph in Nanaimo on Vancouver Island. Chrome knobs top it off. 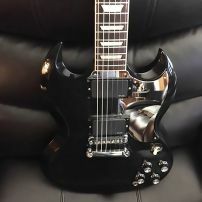 commented on "Black Gibson SG Super Mirror Steel Metal Pickguard, Truss and Tenon Cover Chrome 3 Piece Guard Set"
Martin's boss Gibson SG lounging on leather in Quebec, Canada. 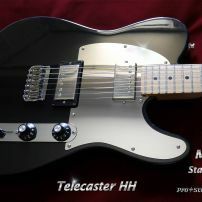 Love it, the classic look of black & chrome will always be a legendary combo.